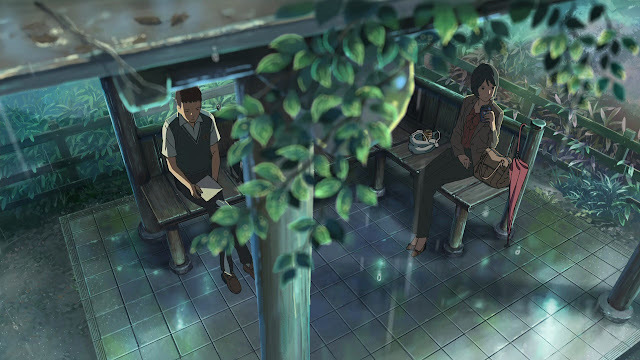 Kotonoha no Niwa is a short romance film directed by Makoto Shinkai that recently came out. I've only watched a few of Shinkai's works because they tend to be sad I don't like feeling sad after I watch something. However, given the short length and the stunning visuals of several screenshots that I saw, I had nothing better to pass the time at 4am in the morning. This will contain spoilers so proceed at your own accord. Being an anime film, and being a Shinkai film at that, it goes without saying that the visuals are outstanding. The sheer amount of detail and work that was put into the background, the rain, and of course the scenery is astounding. The audio is excellent as well. I especially like the ending song. 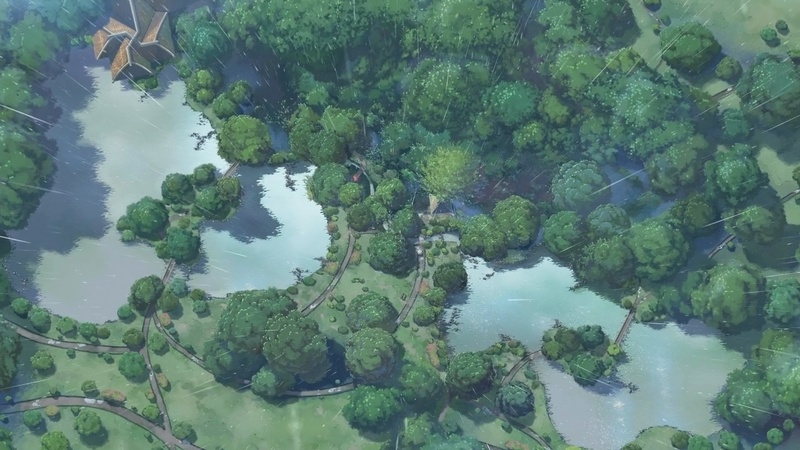 The gist of the film is about a young aspiring shoemaker, Akizuki, meeting an older woman, Yukino, in a park during rainy mornings. With each progressive meeting, the two seem to get closer. However, their relationship is rather one sided; Akizuki opens up to her about his career plans, but Yukino never really says anything about herself. As the rainy season passes, they don't meet. When the new semester starts, Akizuki finds out that Yukino is actually a teacher at his school, and that she's quitting her job. In the earlier part of the film, we see the movie through Akizuki eyes. Even after seeing a bit from Yukino's point of view, we never really find about the root of the issue until Akizuki finds out. I feel that this is good direction. Furthermore, Akizuki mans up and confronts the upperclassmen that were spreading rumors about Yukino. He even confesses to Yukino shortly after. Compared to your standard fare of anime main characters, this guy is pretty good. There is a lot of symbolism in the movie. 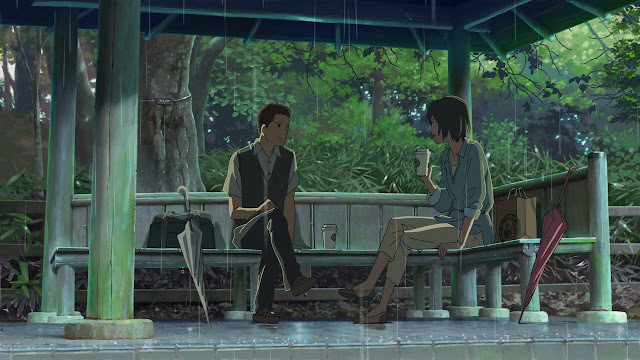 When they first meet, Yukino uses a tanka to ask if they would only meet during rainy days. Akizuki responds by saying that he would meet her even if it wasn't rainy on a sunny day. 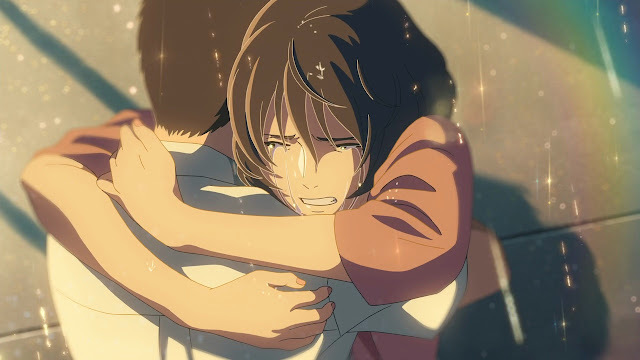 At the climax of the film, the sun peeks out of the clouds when she hugs him. 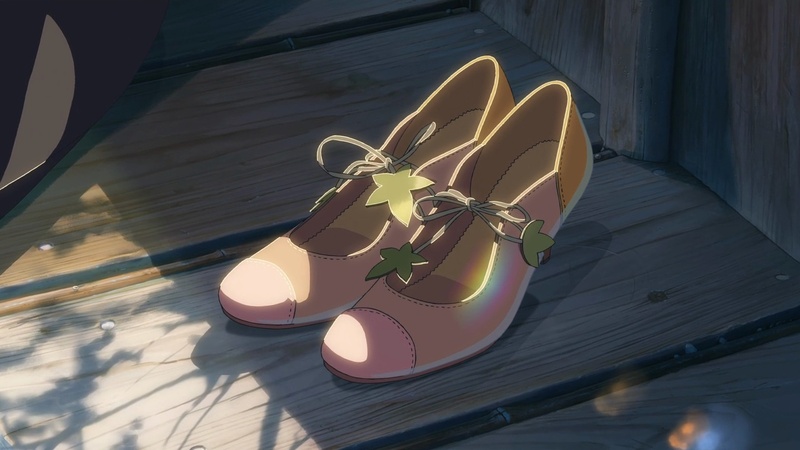 Another symbol used were shoes. Yukino mentions that she is learning how to "walk, albeit barefoot," or move forward from her situation. As she runs out of the apartment to chase after Akizuki she is barefoot; Akizuki making her a pair of shoes is symbolic for their meetings together that helped give her strength and get past her depression. The shoes help protect her as she "walks," or moves forward. Although the ending of the movie may seem rather inconclusive, I think it's heavily implied that the two will meet again some day. Overall, I felt that this is a very solid short film. The visuals are fantastic, and the audio is great. 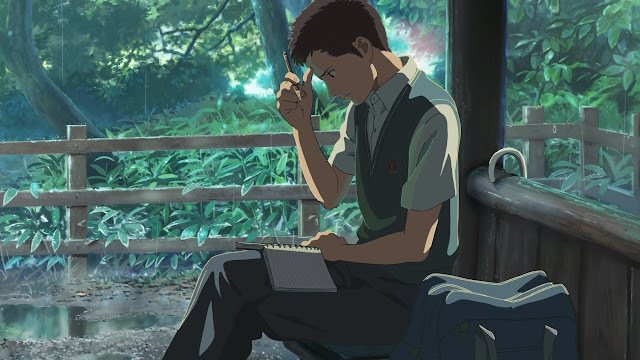 The story and characters aren't perfect, and the climax is a tad bit melodramatic, but I feel that it works well. I would definitely recommend anyone to watch this movie, especially if they're a sucker for romance; it is well worth the 45 minutes. I'll leave with the ending song.